Blood Avocados No More: Mexican Farm Town Says It's Kicked Out Cartels : Parallels Americans will mash up and scarf down millions of the fruits in one day — Super Bowl Sunday. According to authorities in Mexico, at least one town grows what you might call "conflict-free avocados." 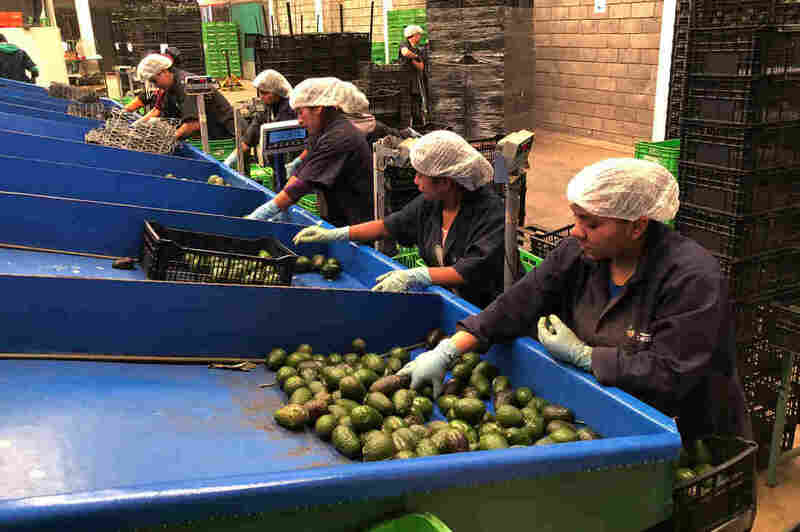 Mexican avocados roll down a production line at Frutas Finas packing plant in Tancitaro, in the western Mexican state of Michoacán. Production has ramped up by 50 percent since December to satisfy demand in the US for Super Bowl Sunday, the highest consumption day of the green fruit by Americans. Avocados have rapidly become a staple in many U.S. diets, with Americans consuming on average 7 pounds a year. To satisfy that surging popularity, imports from Mexico have skyrocketed. That's made a lot of farmers rich — but it's also drawn the attention of organized crime gangs. One town in Mexico has been able to fight off the gangs and keep the peace, and wealth, at home. It's Tancitaro, a small farming town of about 30,000 in western Michoacan state. Super Bowl Sunday is a big deal here. But not because of the sport. "We know when it's Super Bowl time," says Hugo Naranjo, the manager at Frutas Finas packing plant. "Our production jumps." Line workers sort freshly cut avocados at Frutas Finas packing plant in Tancitaro. Forty-five percent of the world's avocados come from Mexico. Eighty percent of avocados consumed in the U.S. come from Mexico, the majority from the small mountain town of Tancitaro. 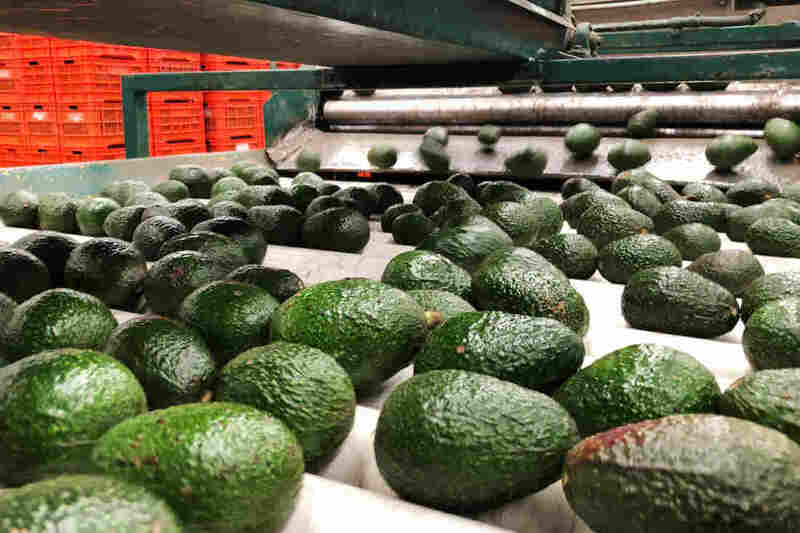 Since last month the plant has been packing 40-50 percent more avocados than normal. 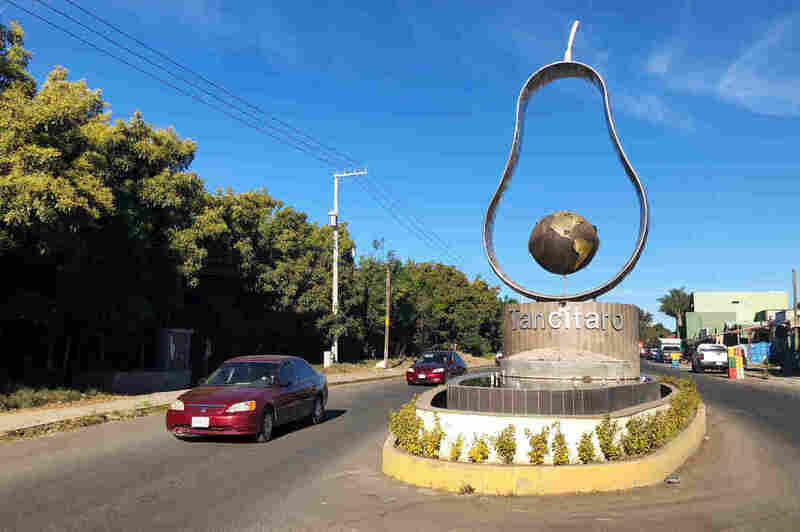 "We produce more avocados here than anywhere else," boasts Tancitaro's mayor, Arturo Olivera Gutiérrez. He estimates the town's exports top $1 million a day. "That's given us a lot of work," he says. "And I'm sure you've felt it, Tancitaro is a tranquil place," he adds. That's not something a lot of mayors in Michoacan can say. 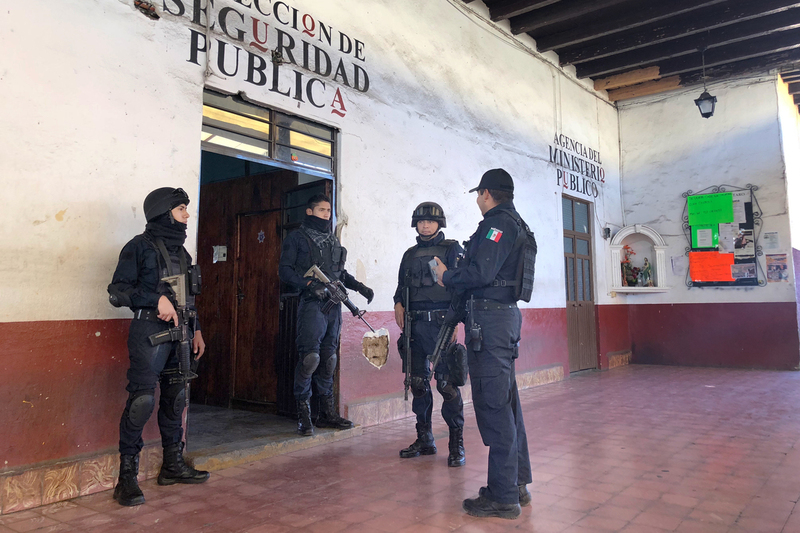 The state, long a key center for some of Mexico's most vicious organized crime gangs, was just slapped with the U.S. State Department's highest advisory warning travelers to not go there. Mayor Olivera says his town was once very dangerous. As avocado production grew, drug cartels moved in realizing they could make good money extorting growers and packers. A silhouette of an avocado in the traffic circle at the entrance to Tancitaro. The popularity of avocados in the U.S. is making some in Tancitaro rich. Two of the country's powerful narco gangs even got their start forcing avocado farms to pay up, according to a report from the Mexican attorney general's office. "They were the ones that made the rules and enforced them," Olivera says. Farmers and packers had to pay taxes to the gangs. If someone didn't comply, Olivera says dead bodies would be put on display for everyone to see, with warning notes attached. In late 2013, Tancitaro's residents said they had enough. And like many towns throughout Michoacan, they took up arms, forming self-defense groups to drive the gangs out. Police officers of Tancitaro's 80-member force gather before going out on patrol. Tancitaro went a step further and built a solid police force. Many on the force themselves have worked for their family avocado businesses. Many were long extorted by gangs. "You just felt robbed," says Assistant Police Chief José Antonio Flores Quezada. "You work and give your all to your land and then someone comes and just takes it away." Flores' neighbors recommended him to the new force, which requires that only trusted locals can join. Tancitaro Assistant Police Chief José Antonio Flores Quezada patrols the town in an armored pickup. His family has been in the avocado business for generations and used to have to pay extortion money to organized crime gangs. Four years ago, he joined the fight to run the gangs out of town. By early 2014, they had 80 residents, trained and ready to go. The new force is equipped with armored patrol trucks, and each officers wears full combat gear, including bullet proof vests, helmets and high-power rifles — all provided for by the state police. Their salaries come in part from local avocado growers and packers, who wield much power and influence over the town. The other half comes from city coffers. Flores steps out of the patrol truck at one of eight checkpoints set up on roads in and out of Tancitaro. A crew of eight men has been on watch. They're hanging out in chairs in front of a brick and concrete barricade that looks like a medieval tower. Some play cards to stay awake through the last hours of their all-night shift. They are part of a civilian volunteer force working alongside the police to report any suspicious activity. Chief of Police José Hugo Sánchez Mendoza says they are vital to the town's safety. As well as the backing and support he gets from every resident. 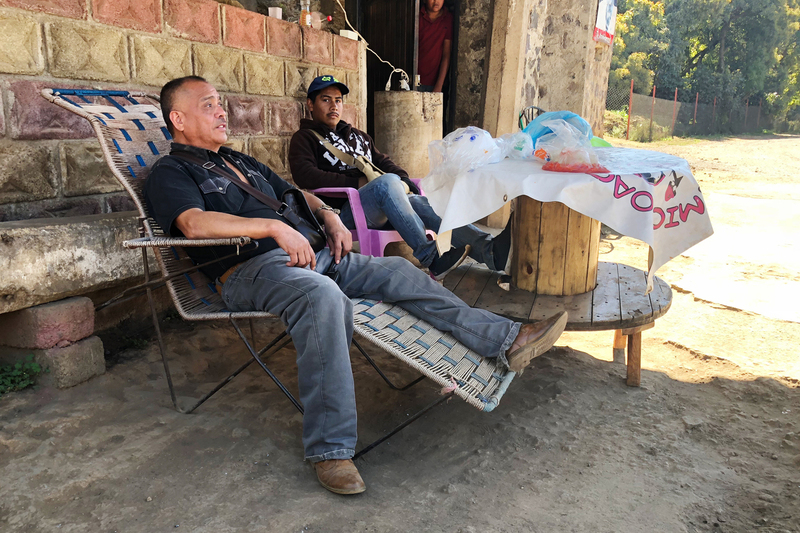 Rafael Cortez Pérez guards a road leading into Tancitaro with his nephew. He is one of 16 civilian crews that watch the roads and report any suspicious visitors or activity to the Tancitaro police. Cortez, who doesn't get paid, says it's a lot of time to volunteer, but worth it for the town's peace and tranquility. "You could say we are 80 police officers, but we are really 30,000 more," he says. 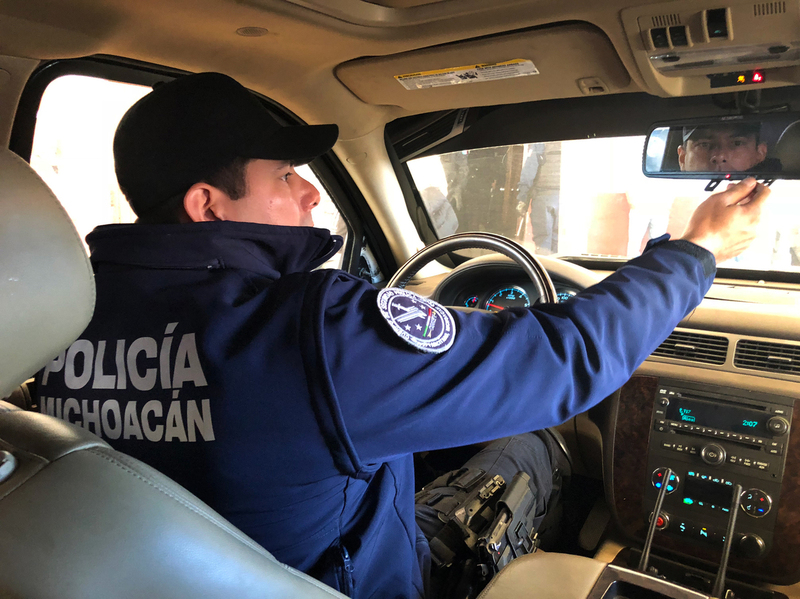 While other Michoacan self-defense groups have either withered away, been co-opted by cartels or disbanded by the government, members of Tancitaro's militia enlisted in the volunteer and professional police, which are entering their fifth year on the beat. The mayor said crime has fallen since the community and police joined forces, although he said there were no current statistics available for the town. Police Chief Sánchez says its success is due to the love and trust his officers have with the community. It also helps that worldwide demand for avocados remains high, providing a healthy income for officers and most residents too.